It comes in a glossy black squeeze tube. Sturdy and classy. The texture of this is neither runny nor thick, it is the perfect consistency and is really very easy to blend. It comes in 6 shades but 5 shades are available in India which will suit a wide array of skin tones, mine is 02 beige and it matches my medium skin tone perfectly. I do not have major acne/spots , only uneven skin tone and on me it gives medium to full coverage depending on how much much I use , it is pretty buildable. 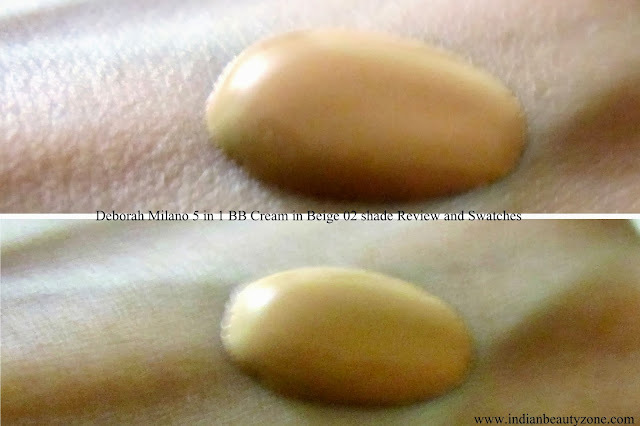 It gives a semi matte finish and It is perfect for oily/combination skinned beauties as it gives a matte finish as well as controls oil for upto 6 hours after which my t-zone needs a touch-up with a powder. Dry skinned beauties will definitely need a moisturizer underneath or otherwise it will cause dry flakes etc as it is not moisturizing.It stays on for 7-8 hours and I only need to touch up once, so it is much better than Loreal or Lakme in that regards. It has a floral fragrance to it that I don't really like. 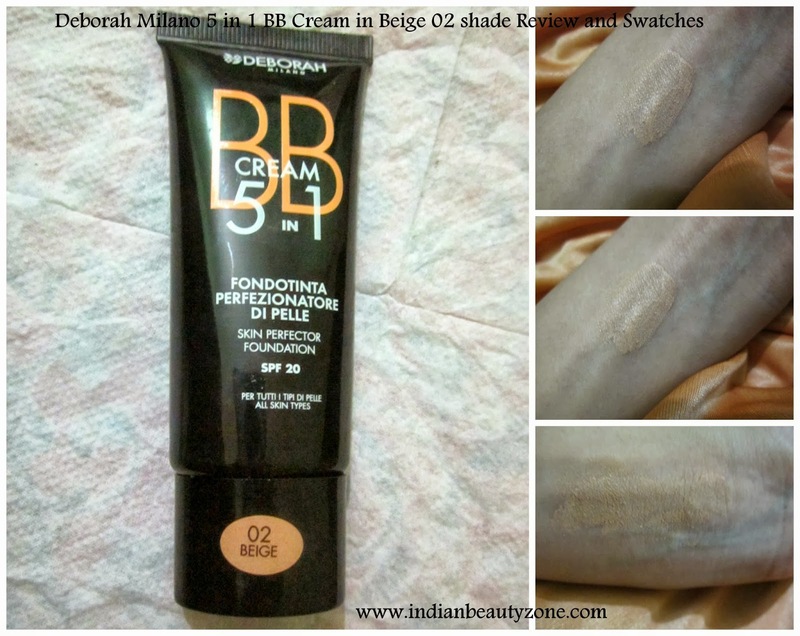 Deborah Milano 5 in 1 BB Cream is an affordable BB cream that gives much better coverage than Loreal BB or Lakme CC cream, covers minor to moderate spots effectively , has a matte finish and controls oil for upto 6 hours, It is an affordable BB cream great for oily skin. Your review is really helpful, my skin type is dry and I only like to use moisturizing products, if it makes dry patches visible then I probably will skip it, can't stand dry creams.. Great review dear.. I have just pulled it out of my stash!! I have been wanting to try Deborah for a long time. Just haven't got around to doing it yet. Nice review, does a great job for it's price. I have oily skin too, so I understand the pain of finding the right bb cream. Great review, xoxo. I might try this as i have oily skin! Nice review Bipasha!! :) White case is a problem with most of the BBs if aren't blended. will try this when I am done with other BB creams! but, umm Where did you get this from?